Breaking Dawn Teaser Trailer Revealed! The long awaited teaser trailer The Twilight Saga: Breaking Dawn Part 1 just debuted at tonight’s MTV Movie Awards and on IMDB, and we absolutely had to share it with all of you right away! Check it out and let us know what you think in a comment below! 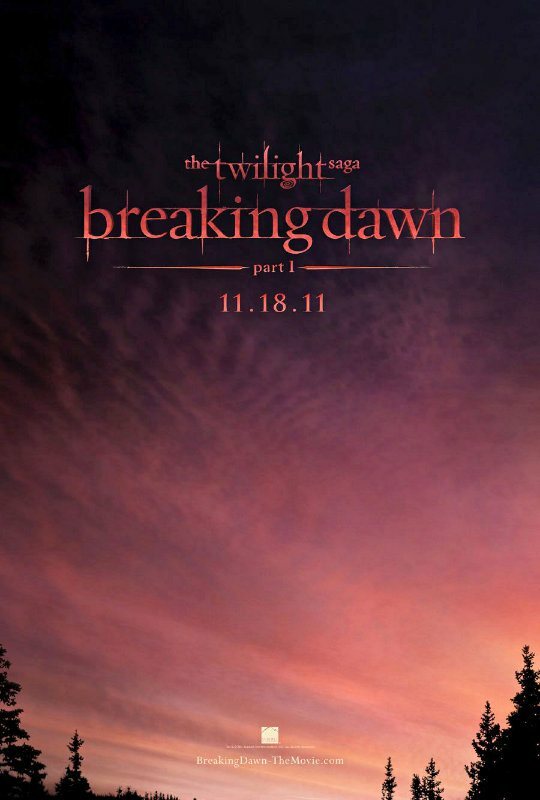 The first of the two Breaking Dawn films is set to hit theatres on November 18, 2011. Part 2 won’t follow until a long year later on November 16, 2012. “In the highly anticipated next chapter of the blockbuster The Twilight Saga, the newfound married bliss of Bella Swan (Kristen Stewart) and vampire Edward Cullen (Robert Pattinson) is cut short when a series of betrayals and misfortunes threatens to destroy their world. After their wedding Bella and Edward travel to Rio de Janeiro for their honeymoon, where they finally give in to their passions. Bella soon discovers she is pregnant, and during a nearly fatal childbirth Edward finally fulfills her wish to become immortal. And in case you missed it before, here is another look at the super plain and somewhat boring teaser trailer for The Twilight Saga: Breaking Dawn Part One. Here’s hoping the future Breaking Dawn posters are much more exciting than this one. So Twi-hards, how totally excited are you about the little teaser trailer? Love it or hate it? While short, the trailer actually reveals quite a bit about the film. Many are wondering how far into the book the first movie will go, and from the looks of it they are taking it all the way to the pregnancy. ‘The Mortal Instruments’ Books Coming to Theaters! can’t wait and it looks like the acting has improved too! Yay (for both the trailer and the acting getting better) can’t believe they are making us wait a whole year for part 2! I’m hating summit at the moment for that ridiculously dumb move! but still the movie looks epic! who wants to squeal like I dumb tweens with me? anyone? no takers? suit your selves! im not a huge twilight fan but breaking dawn is my favourite book, and this movie actually looks like it will do it justice (unlike the other movies). and waiting a whole friggin’ YEAR inbetween the parts is HARSH! bc so many will be dieing to watch them together.